‘Tis the season of state tournaments and holiday cheer. It is also a time of giving and helping those in need. In 2009, LEAP, the WIAA’s student leadership group, started using the WIAA State Championships as a vehicle to fundraise for local charities. 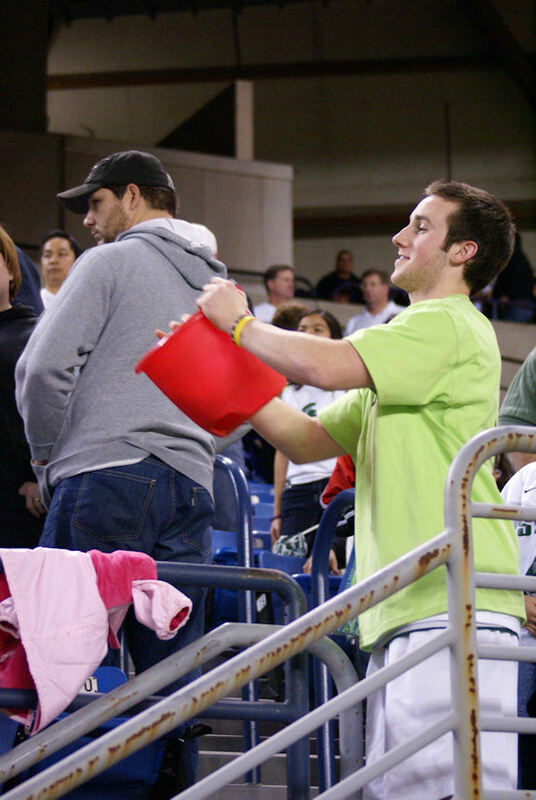 The students named their initiative “Coins for a Cause” and launched their efforts at the 2009 3A and 4A State Basketball Championships, raising over $1,000 to benefit Special Olympics of Washington. LEAP (Leadership through Education, Activities, and Personal Development) is currently comprised of 13 high school juniors and seniors who are involved with WIAA events, meetings and community projects. The Committee includes students from all across the state with at least one student representing a school from each of the WIAA’s six classifications. Among the 13 students, all but two of the WIAA’s 19 sports and activities are represented. The students actively contribute to the WIAA as the voice of Washington’s nearly 230,000 student-participants. After raising $1,000 at 2009 State Basketball in the inaugural year of the fundraiser, the LEAP Committee stepped up its efforts in 2009-10 by raising over $5,000 at State Football and State Basketball, along with some additional fundraising at the Mat Classic State Wrestling event. All funds were donated to the Special Olympics of Washington that year. In 2010-2011, the fundraiser generated its largest return, with State Football and Basketball tournaments raising over $6,200 for the Special Olympics of Washington. This year’s Gridiron Classic donations will benefit Northwest Harvest, the only non-profit food bank distributor operating statewide in Washington with a network of over 325 food banks, meal programs and high need elementary schools. Later this March, 2012 Hardwood Classic donations will go toward the Special Olympics Washington. Supplementary to the “Coins for a Cause” fundraiser, The Dairy Famers of Washington and Les Schwab Tires will conduct a Gridiron Classic Food Drive at this year’s State Football finals – a food and cash/check drive to benefit Northwest Harvest also. Cans of non-perishable food will be collected in order to help local families in need. Each of the first 250 people who bring at least three cans of food or donate cash/check will receive a free Dairy Farmers of Washington grocery tote bag, a copy of the Naturally Nutritious cookbook and a coupon for services from Les Schwab Tires. A $100 Fred Meyer giftcard for dairy products will be hidden in one of the tote bags. The food drive will be held on Friday, Dec. 2nd from 11:00am-3:00pm. Jeff Steele, Director of Retail / Foodservice Marketing and Processor Relations for the Washington State Dairy Products Commission, appreciates the opportunity to spread awareness in the community about the need to donate. The WIAA along with its student leaders and corporate partners find great value in the opportunity to raise funds for charitable organizations through the state tournaments. For more information about any of these programs, please contact the WIAA Office.